Forget your fancy arcade sticks. The breakout player during this year's EVO fighting game tournament used a gamepad to beat down all comers. Not just any gamepad, either. Luffy won the top spot with a controller from the original PlayStation. A member of the Meltdown pro team, Olivier 'Luffy' Hay ran an incredible winning streak straight from the Losers' Bracket to the Grand Finals of the biggest fighting game tournament in the world. In the last series of Ultra Street Fighter IV matches, Luffy used Rose while Japanese player Bonchan chose Sagat. 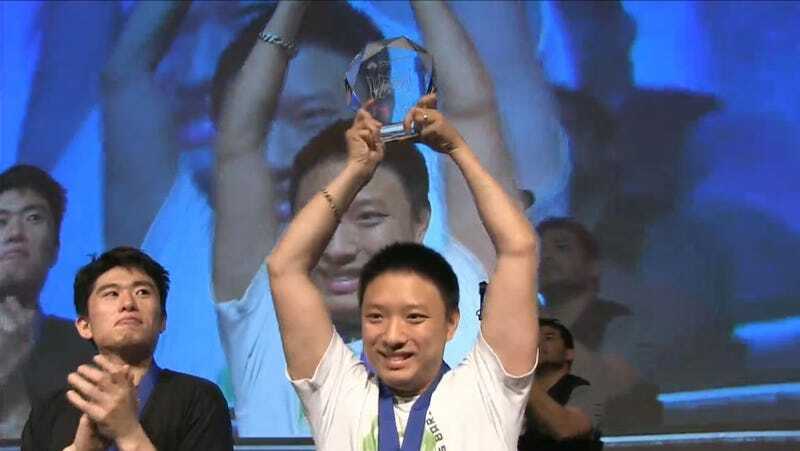 The fights were a study in contrast whenever the camera cut to the players, with Luffy's ice-cold confidence being conjured by hands that were hidden from view while Bonchan's visible move inputs seemed unable to come up with an answer. And, every time that grey controller flashed into the shot, it seemed to defy belief. "Really? He's running game with that?!" Lots of personal storylines feed into an event like EVO. Redemption for past defeats, characters becoming newly dangerous thanks to inspired players, regional dominance becoming a thing of the past. Some of those narratives can be expected, though. The fact that Luffy won out with a controller that's largely considered a relic of video game history is a bit of a poetic surprise. One that's a signifier for how far video games have come from the days of the first PlayStation all those years ago.